The yarn is a "discount supermarket" yarn. I kid you not, I bought it at the Netto discount supermarket here in Germany. The yarn is a 4-ply, 75% wool, 25% polyester and it's decent stuff. Decent at least for socks anyway. The label just says "Sockenwolle" and that it was manufactured for SILAG Handel AG, which is just a company that supplies consumer goods, so I have no idea really where the yarn comes from. 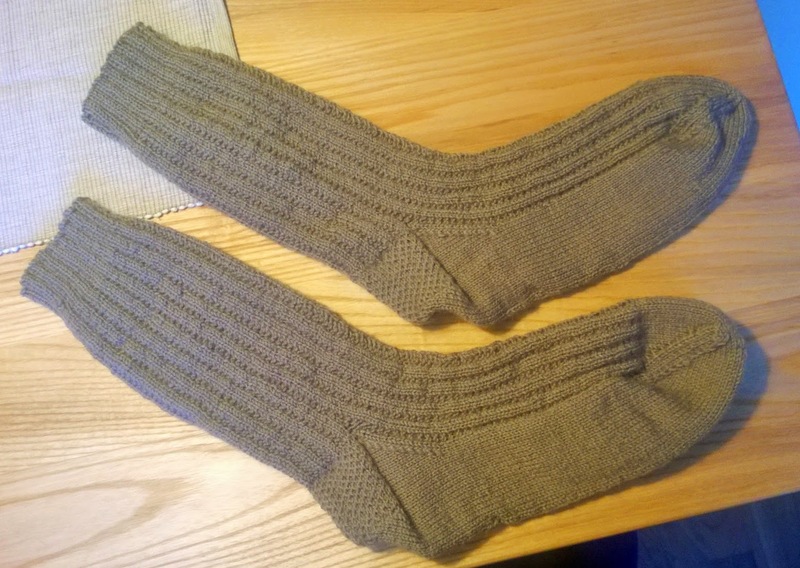 The pattern is the Garter Rib stitch from Charlene Schurch's book Sensational Knitted Socks. If you've never knit socks but are interested, this is the best book, I think. The book explains the parts of the sock and has instructions for making a sample "first sock." The best part of the book though is that you can make any size sock, in a multitude of patterns, either top down or toe-up, and with 4 or 5 double point needles or 2 circular needles. And if there aren't enough patterns in the book for you, there's a second book, More Sensational Knitted Socks. For these top-down socks I used the Old Norwegian Cast On, and for the heel I used Eye of Partridge. It was more about using up the yarn than about wanting this scarf, but I do like the way it turned out and have named it my "Snowball Scarf". I alternated two knitted rows of Schachenmayr SMC Sheila Soft Mini (a fuzzy yarn) with two knitted rows of Schoeller + Stahl Alpha (a smooth yarn). The 50 gram balls of the Alpha had less yardage than the fuzzy one so I just knit until I ran out of the two balls of Alpha. I cast on 25 stitches on size 11 needles and then joined the ends so that I could just loop the scarf around twice around my neck. It was easy, mindless knitting while watching TV, and I used up some stash yarn. Hooray! The weaving for this scarf went very quickly, but the twisting of the 316 fringes...not so fast. I have this fringe twister* but it still takes time. The finished length off the loom was 69 inches but after washing in a tub of 40 degree water (per the care label on the yarn) it shrank by 3 inches in length. The yarn is a bit scratchier than I'd prefer but overall I am happy with the way the scarf turned out. 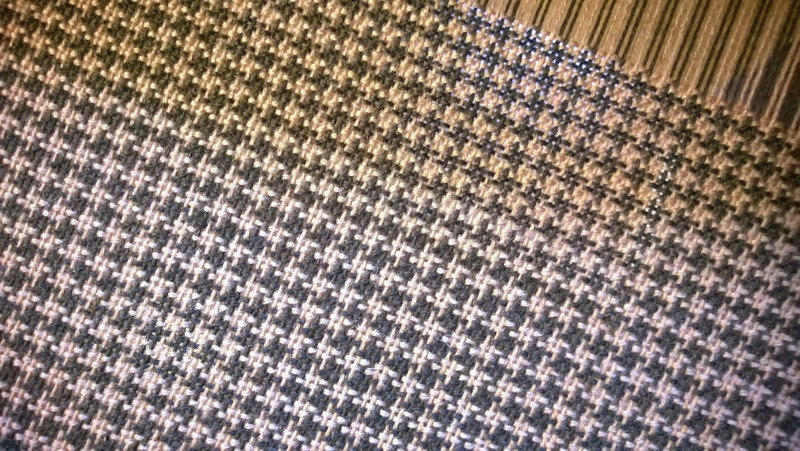 I absolutely love that you can alternate colors in the warp and the weft and make a pattern - hounds tooth in this case. 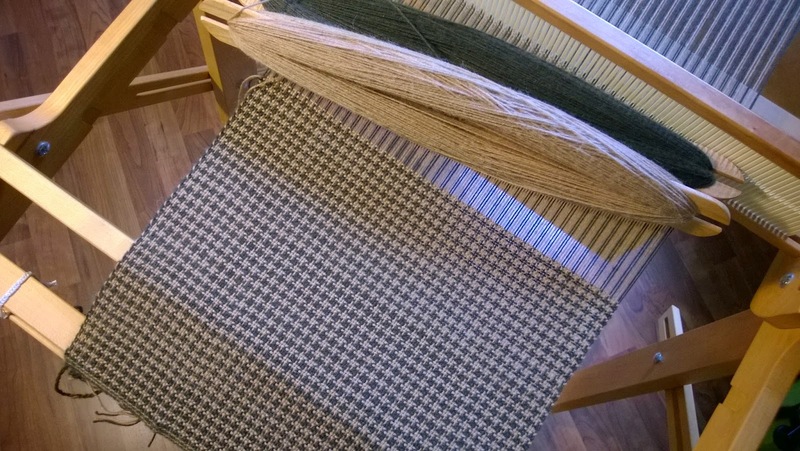 I used my Schacht rigid heddle for this, so it's a plain weave but it has inspired me to warp my Schacht 4-shaft and make one in a twill. The yarn is Lana Grossa, which I purchased in the Müller drug store. Well, not actually a "drug" store since they don't dispense drugs there, but it's like a U.S. drug store without the pharmacy: perfume, makeup, personal products, homeopathic remedies, some organic foods, candy, stationery (pens, pencils, notebooks, etc), toys, household goods...and yarn. This one is also woven on the rigid heddle - no I did not get the 4-shaft warped...yet. The yarn is Drops 100% Alpaca. My goal for this is a softer scarf (and a colorful one!) but the alpaca may not have been the best choice for a warp yarn. I've had one occasion where one ply got cut by the heddle, and I didn't notice it until the loose ply got backed up behind the heddle, leaving one thin warp yarn. I was able to wrap the loose ply around the other one and carefully continued to weave. Fortunately this won't be a long scarf, but it's a lesson learned about using a soft yarn that doesn't stand up to abrasion in the warp. I kind of knew this already from reading weaving books, but I threw caution the wind on this project. I'm also gambling on having enough yarn left. 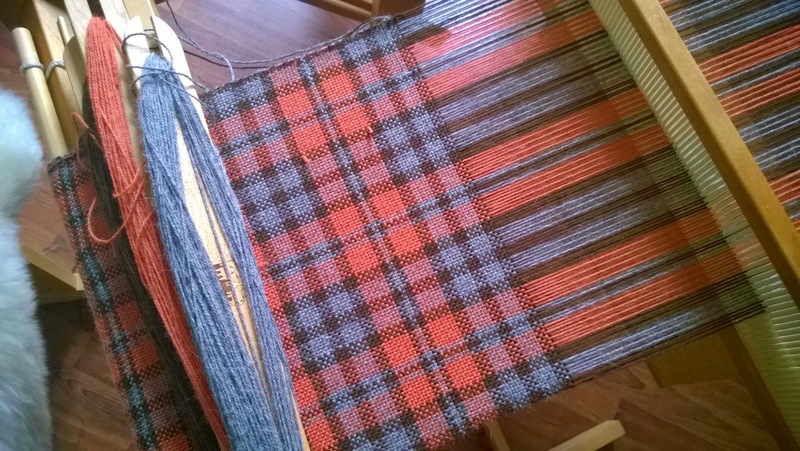 I only had one ball of each color (orange, brown, and gray) so I purposely designed this plaid to use all three colors evenly between warp and weft. We'll see if my calculations were correct! 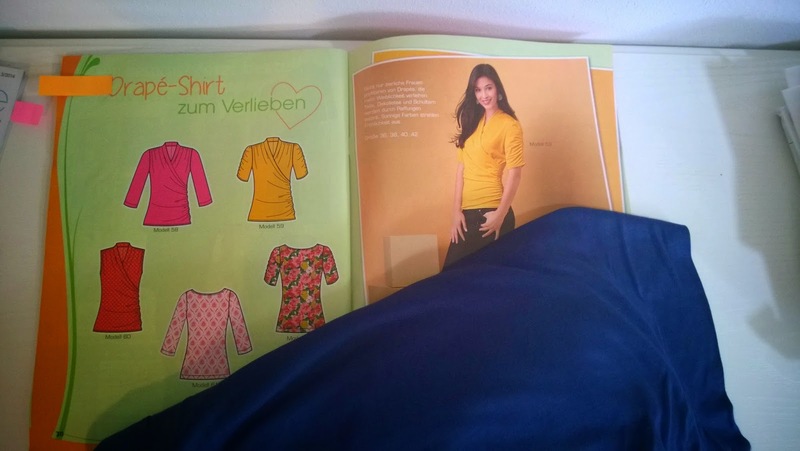 The pattern is New Look 6150, although I used the pattern from the Meine Nähmode magazine, a German magazine that republishes Simplicity and New Look patterns. The fabric is a rayon knit, purchased locally. I was hoping to make a casual type top but the fabric is thinner and has more drape than I envisioned in my head. I see wearing this top under a suit jacket, though I don't have the occasion to wear suits right now. The top was fairly easy to sew. I had some difficulty understanding the German instructions for the collar but fortunately Pattern Review came to the rescue. I wasn't the first person to have difficulty...even in English. If you're sewing the same pattern, or one similar, here is a link to a discussion on how to sew the collar. 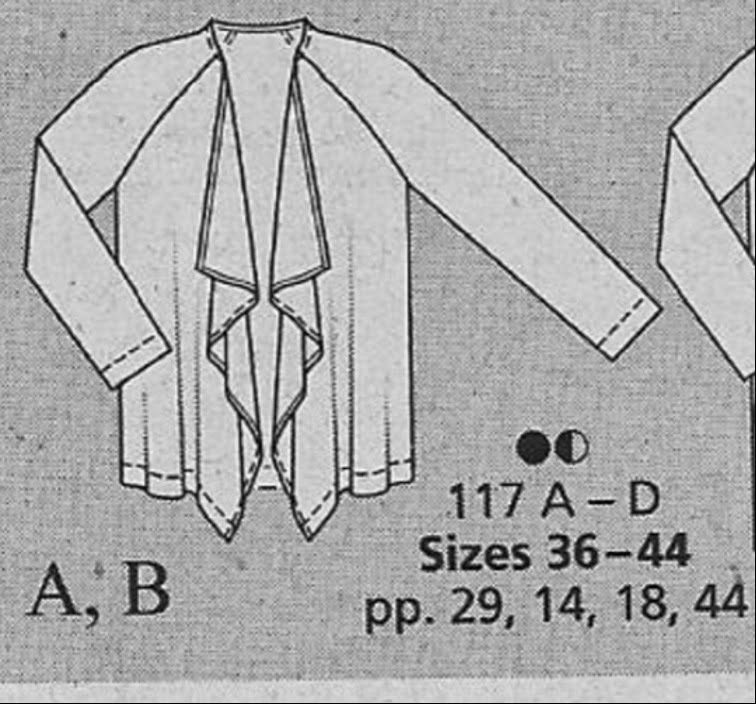 I've gotten as far as tracing the pattern, which you know is not a small task if you've ever used the Burda magazine patterns. * I was not compensated in any way to pitch the fringe twister or the online store; however, I do like the items I have bought from them and think they have very good prices. WOW! You have been busy cranking out some awesome things!! 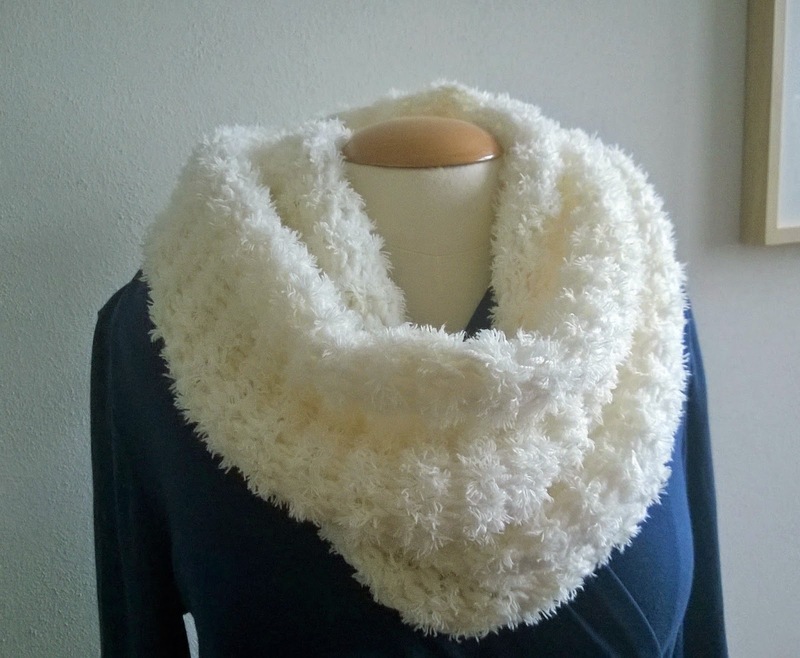 I will take the snowball scarf if you need to find it a home ;-) It's beautiful! I am pretty amazed by your weaving. Such a cool skill to have! Wow, I love the pattern on your plaid scarf! Good luck!